Tracking Your Progress or Just Gaming? Hey, that is a long time for some of us, ok? Anyway, over the past year I’ve had coworkers singing the praises of Todoist. But it was never of interest to me. 2Do is far more visually appealing and I tend to dislike apps that are cross platform. But there was one feature that kept me coming back and reviewing the app every 3,4 weeks. Karma. That’s right, a scoreboard. I’d keep checking out the service to see how it was progressing, would compare the UI with 2Do, then walk away. But I finally decided to give it a test run. Jokes aside, I’m a big believer of one of the pillars of 4DX. Keep a compelling scoreboard. The premise is that people play differently when they’re keeping score. And while that may seem childish when it comes to our own productivity, I believe the concept has merit. But how does the feature pan out? Is it a gimmick, or can it improve one’s focus? I wanted to find out. Overall, the app is well designed. It’s not the most aesthetically pleasing, but that is likely intentional and it appears to be focused on providing a similar experience on the multiple available platforms. 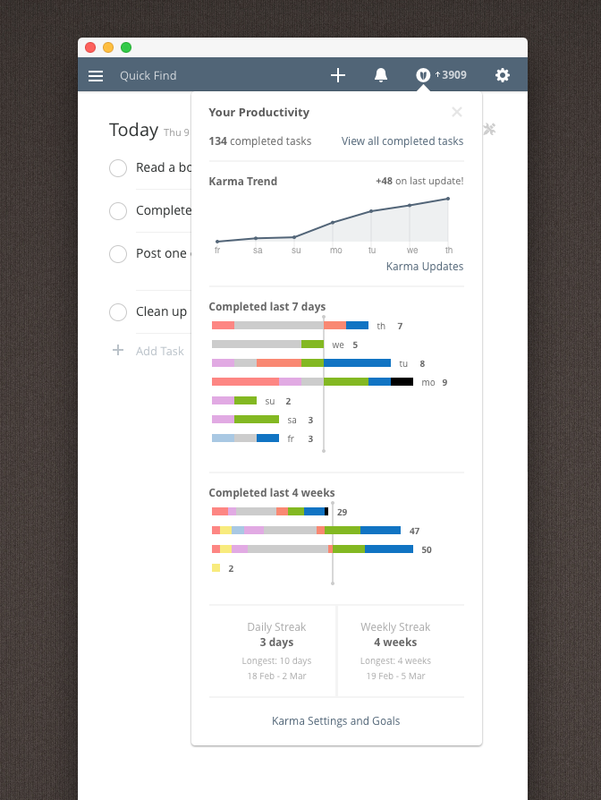 But for getting tasks into Todoist, then actually doing them, it’s a good tool. My intention here is not to write a full review of all the features. I’m focused solely on the Karma feature. How does the karma in Todoist work? Details are available on their support site. Simply put, completing tasks and projects contribute the most to your score. And you are able to set goals for your weeks and days: I want to complete 5 tasks per day and 30 per week. Doing so gains you points, and so does keeping a streak of days and weeks going. You can see this in the screenshot above. It’s clever in many ways. Here are my observations in a month of usage. Let me start with my biggest complaint, a very obvious one. It would be good to be able to differentiate between busy work and tasks that actually move your most important work forward. Unfortunately, a reminder to take some meat out of the freezer for dinner carries the same weight as writing a new draft of an onboarding email for the product I’m working on … this makes the statistics of far less value. Tracking progress is important though. Perhaps for some people, certain methods are more useful than others. You can use use a journal (pen and paper even), a spreadsheet, or a wall or desk calendar to achieve the same purpose. But having this done automatically for you by your task management app is valuable. Back to my first point, if you were to manually track your successes, you would not write down the fact that you took out meat for your dinner. It would be great if the app could recognize the difference. I want a tool where I can remind myself of items like prepping dinner, but also track the things most important to my life goals. With 2Do, I used it to track the latter, and set reminders for myself with Fantastical and Reminders on macOS. Karma is not a great measure of your true success (or lack thereof). Since feature usage is included in gaining karma, it’s also fundamentally more about Todoist’s success than yours. Why should using labels increase my score? All said, it is a good way to measure your cumulative activities. The streaks feature is fantastic. There is power in the habit of tracking your habits (see James Clear for more on that). So an app that keeps this in the foremost of your mind is a good thing. You have to work hard to force yourself not to game it. Go ahead and add the little administrative tasks that are a part of your day. That's a part of life as well. But more importantly, it helps you to really take your most valuable work, break it into discrete, concrete tasks, then work on those. Every day. This helps you to build confidence that you're making real progress and not just busy work. And it adds incentive to keep those streaks alive. It’s clever overall. I’m not sure I’ll stick with it, but I appreciate this feature. If it was included in 2Do, I’d be a very happy man.